Discussion in 'Other Toys/Hobbies' started by FIREWIRE1394, Jan 27, 2019. With a few topics around and lots of us thread crapping Komm’s amazing thread HERE I’ve decided we need a thread for slot cars. Komm’s thread is worthy of being it’s own thing, but for the rest of us, slot cars aren’t really popular enough to need a new thread each time, just a bumpable thread once or twice a year AHAH. Vintage, modern, small or massive scale, played them somewhere or doing your own setup it doesn’t matter. Ask questions, do reviews, post photos etc. We better not do any trading in thread, but PM’s are accepted as far as I’m concerned for meetups and races which are pretty popular in the slot car community. The earliest known commercial Slot cars were made by Lionel (Famous for their model trains) in 1912. and were basically cars on train rails. Over the next 40 odd years numerous other methods and systems from both hobbyists and companies came and went. I might get into brand history later, but for now, this is enough. The slot car as we know it today is basically from the 1960’s. when the tin models became plastic, rubber tracks also became plastic and the scale of most models was changed to 1:32. And due to the popularity of this configuration, for the first time there was a standard in the industry. And one that has been in place ever since. By the late 70’s, the boom was well and truly over. And things settled down. In the late 80’s and early 90’s cars started to look really good, but nothing major had happened for a while. By the 00’s something new was coming, with digital technology being worked on, and a few different systems were soon to be on the market. 1:32 is by far the most common worldwide (both in home and commercial raceways), and many models have been made in this scale by many brands. 1:24 is favoured by lots of serious racers and hobbyists. Bigger cars mean bigger tracks and bigger motors and often more details on models. This is what you go to if you want to get really serious. 1:64 is the current small standard, great for kids or setups where space for a track won’t allow a bigger scale. This smaller 1:64 scale was often confused by being labelled as “HO” by brands like Tyco and Aurora AFX… (FYI HO is 1:87 and always will be) so these days most smaller ones are just 1:64. Not limited to kids or small spaces though, some people just love the insane speed these cars can go and stay on the track. As a note: Carrera also have a product called ‘Carrera GO’, which is 1:43. And while not a popular scale in history, it has been growing. If you’re looking to buy a Brand new smaller set, I would be getting this above Micro scalextric and AFX etc etc as track parts and cars are easier to find separately than things from 1:64. and it can grow with kids, you can start with wacky loops and jumps. There are Mario kart and pixar’s cars themed sets, and if the kids don’t lose interest, you can get some nice looking supercars, GT’s and even go Digital up to 3 people as well. If you insist on less than 1:32, this is what I’d be getting today. Let me start by saying this: Slot cars are a comparatively cheap hobby. I know people who collect model cars, model trains, RC EVERYTHING, computers, video games and at many times, I’ve been involved in all of these things. I’ll use model trains as an example.. Mainly because model trains are more expensive than writing off classic Ferrari’s while on cocaine.. If you or someone you know has ever been a model train enthusiast, $300+ for a decent locomotive. $1000+ for truly special. You can get a decent slot car for $50. and something truly special for around $250. And unlike traditional models, you can get some absolutely stunning cars to put on a shelf, and can actually drive them! In the real world, I could never Drive a Mclaren F1 but now I can not just look at a static display behind glass.. I can drive them when the mood strikes. And that’s not to mention competing with them. Hands down the BEST place to get started. They’re friendly and knowledgeable, do sales, races, servicing, parts and everything. I cannot comment on their new address or what tracks they have for racing ATM, but it’s the same people who are basically walking encyclopaedias with probably the biggest range in the country. 7/19 Hotham Parade, Artarmon NSW 2064. These guys focus more on racing and custom track building, not a huge range of stuff, but they can order stuff for you, and have some great tracks if you want to go for a race or 2. 3/42 Hallam South Road, Hallam Vic 3803. Some great tracks and a great range of new and used cars. I found some nice cars here that I couldn’t find anywhere else in the country. I went in for a single car, stayed for 3 hours and walked out with 3 cars and a stack of track in late 2017. 293 Princes Hwy Arncliffe 2205. A bit out of it in Shepparton, but a great raceway, they even had a digital track last time I was up there. Lots of spares and racing who also have R/C tracks as well as slot cars. 37 Lockwood Rd Shepparton, Victoria 3630. A block away from them is a toyshop/hobby store http://www.prohobby.com.au where I picked up some nice LONG discontinued Scalextric stuff. These guys have a massive track and a pretty good range of cars. I only happened upon them because they had a Lancia and Audi I couldn’t find anywhere, so a bit of a happy accident. 126A James Lane, Waitara NSW 2077. Used to be located in Preston and was one of the best places for EVERYTHING slot cars. Ged knows his stuff, and is known basically by everyone. Very happy he's still running the ebay store. You can save a stack of money with used, but you have to be careful as a lot of stuff has been poorly maintained and will need lots of work. Rust isn’t a problem so much as kinks in the tracks and broken connectors. Assume anything used will need rebuilds/restoration. I will be expanding on this section a bit in the near future with guides and maintenance advise. I’m leaving a tonne of stuff out of this post, But I’ll be adding some pictures soon, and will from time to time do reviews and guides/projects here and there. so feel free to add or talk about anything slot car related. And now for some eye candy. My most recent, most expensive and long awaited slot cars. Scalextric C3894A Legends Lancia Stratos 1976 Rally Champions Twinpack. The Stratos slot cars before this were all horrible for one reason or another, usually they looked wrong, and usually ridiculous in price. This set was $145 and I pre ordered the day it was announced. I'm not a good photographer by any means, but these cars are amazing despite a couple of small faults. faults are: on the promo images they have 2 mirrors, real ones didn't, and they took the mirrors out on the cars, and put some clear plastic where the mirrors WERE before they got shipped. Included Co driver isn't painted, and the driver's eyes aren't painted. I'll be fixing the second fault when I open the cars up to convert them to digital. They're not DPR ready so I'll do some tedious painting when I get around to doing the tedious wiring. Absolutely adore the stratos, so that's why I needed this set, usually wouldn't spend this much for cars. But I made an exception for these, and my next exception will be the New Scalextric Mclaren F1's. So I've purchased a huge used Scalextric digital set off gumtree and thought I'd use this as a chance to show some of what to look for when going used. It was cheap because cars were not running properly, so sold as not working. So there's a bit of surface rust and dirt that would explain why the set wasn't working properly. But we can see in the next photo there's no kinks, or bends or other problems, so this bit is worth cleaning up. One of these blocks will last a long time, and aren't needed once used track is restored. Spray some onto a tissue or cloth, and wipe down the rails. I used tissues cause all my cloths were filthy at this point. The whole track took about 2 minutes start to finish then repeat for all other bits which took me a LONG time (You'll see why in last pic). On older track it may take a lot more effort, and probably not worth the time/effort to restore. I do have some track I fixed up from ages ago that was FULLY rusted out, which took heaps of effort that I only put in to afford good sets, but for some quick racing that effort isn't worth it. I'll try and find pics if of the really bad stuff if I can. buying new, the track alone is worth $1000+ and that's not including cars or the digital controls etc. There's heaps like this around the place, and even if the price isn't as good, this is about what you should be looking for if you want to go used.. 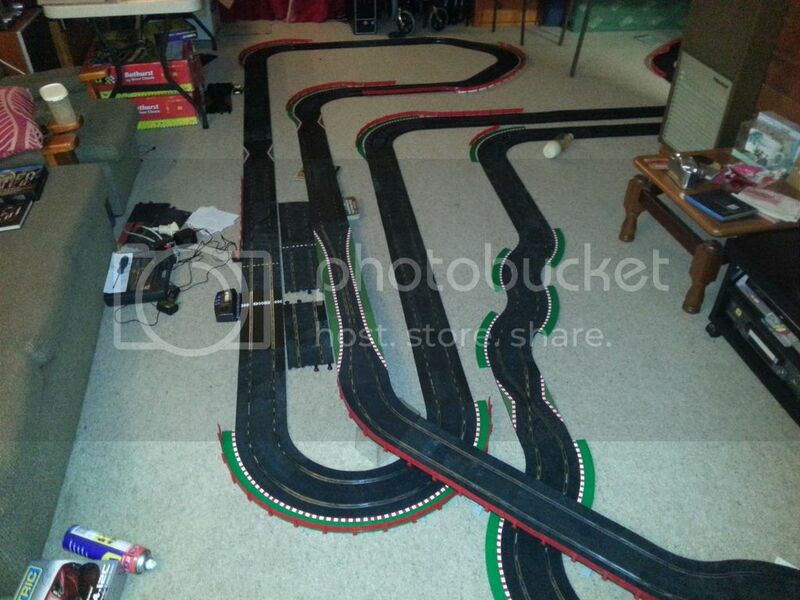 This sport track is what current Scalextric analog and digital sets use, so minimal cost and some slight effort for a lot of racing potential. I put the cars on MY track, 3 worked perfectly without needing to do a thing to them. one I am putting a new motor in. TLDR: when buying used, some surface rust is ok and easy to clean and get working if the tracks aren't bent. shouldn't it be bertone on the B pillar? Indeed, I didn't even notice that.. maybe the painting got stuffed cause of the door frame, or more likely they wanted to save on licensing. CHEAP BASTARDS!! Saves me a bunch of typing and has some interesting trivia. Scalextric C3965A McLaren F1 GTR Le Mans 1995 winner. As this thread will constantly reveal, I have a soft spot for McLarens. So I needed this, even if it was a bit pricey. This car is the new tooling from last year, so I was particularly excited to see it in person. and it has not let me down..
All I can hope is that they use this tooling to make the ROAD version. Why does no one do the road car? slot.it made a road LM but it was wrong on so many levels I don't even count it..
Only decent road version has been Ninco's 50142 from 1997. Mine is looking tired, and is impossible to find a good road one. This was an amazing model in the late 90's, and the lights and exhausts have come a long way in 22 years.. BUT I CAN'T GET A ROAD ONE!!! WHEN WILL PEOPLE LEARN! I went unpacking some boxes at my new place, and came across my very old AFX track (circa 1990s) that hasn't been used in a long time. Going to try and do a clean up like you did. I see you have AFX and Tyco there. I remember back in the day there were adapter pieces for AFX to Tyco, which I assume you have. The picture takes me back a little too, I had the same loop you got there, but I lost the clamp base so had to prop my loop up with books. Trip down memory lane that lot. I'd love some close ups of the chassis you have there, as even that takes me back. I remember wearing through the pickup shoes so often I eventually gave up on buying more and simply soldering where the holes were, then refitting.. Saved a fortune!! you know about the coin trick to clean AFX track? just run a coin over the rails a few times. I tried a track cleaner once.. big mistake! all the flakes got picked up by the magnets and clogged my favorite car. And yes we all have thread crapped Komm a little (or a lot), and there's still some useful info in his thread that I have to put in here, but he's a good guy, so it's fine there for now. Look forward to seeing progress if you clean it up. Finally got around to getting some pictures of the classic Aussie cars that came in the gumtree lot. Scalextric says 1974 winner Brock/Sampson... but this doesn't add up for several reasons. First, a Ford XA Falcon (Goss/Bartlett) won Bathurst 1974.. Brock and Sampson DID qualify first, and were winning easily but blew the engine up. Secondly, Car is Clearly Bill Patterson/Team Brock. In 1974 Brock was racing for HDT. He got fired for not following team orders, and was a privateer for 75,76 and 77. I'm pretty sure this car is actually the 1976 car (Brock/Brock) that finished 3rd. as it doesn't match anything else. So with these cars cleaned up, they'll be shelf queens or sold to fund more Rally cars / McLarens. Tyco? What's Tyco? Sorry I haven't done a lot of research into this. Do you think I should stay away from a track cleaner then? It's only really dusty, there's no rust etc coming through on the slots. Kommy suggested MX3. I just haven't been able to get any yet (And won't till next week). Tyco was a toy company (think they got bought out in the late 90's early 00's) that made slot cars and was slightly less popular than AFX... The Tyco track is the yellow track. It MAY be lifelike track, but I can't see the connectors clearly enough to say for sure, but they had different connectors to AFX. it's not a problem if you've got the Tyco to AFX track adaptor as you can make half the circuit from one type and other half the other type. There's some cheap AFX sets on ebay at the moment if you're looking to expand. Good thing about AFX is there's lots of it, and it was around for a long time with not many changes. And the suggestion of Inox MX3 is probably the best tip when it comes to slot car track you can get! just chuck some between all the joins when you put the track together, and you'll be laughing. and if it's just dust, then wipe it clean, assemble with mx3 then run a coin over the rails when it's race time. Edit: shortly I might do a history piece on AFX but the TLDR is. It started out by Aurora Plastic company who went broke, then got bought out by Tomy, and that's the AFX that all the 90's kids knew. My pieces have Aurora and Tomy (together) written on them. I don't actually appear to have the adapters to use them together. I have a feeling there's a box of it missing somewhere, as it originally had 2 lap things, like a dozen cars, and a heap more track. But I fear the parents threw it all out. I'm pretty keen to get something up and running, only problem I'm having, is is it worth it to try and get this track working, or get a new track and start from scratch? I can't answer that one, go with your heart! But at $264 for a set as basic as that one I personally wouldn't be going new. If you're spending that kind of money to go new, might as well get something current, and widely available (Scalextric, carrera) to start from scratch. Seriously, for a track like that used to be $80-$100. And you could grab a bigger set (like bathurst or thunderloop thriller) for $150..
You could grab a used working lot of AFX, clean up the track you have, and add that to the set. And you're sorted with some basic and quick cleaning and less than half the cost. And the great thing about afx is the flippable transformer, just flip the power plug upside down, and you're going the other way.. no swapping powerbases around backwards or rewiring.. a simple flip and it's done. If you want new go for it and enjoy.. but personally there is something satisfying about fixing track and cars, and of course the race at the end. I just wish I took a second photo to show the dining room and the massive straights in the kitchen. just to show, you can get a lot of fun for not much money, and not much effort. (I used a dremel to de-rust the queensland stuff) and it all worked perfectly when I was done. I wouldn't go to the lengths I did to restore track if you just want some fun, but if the track is pretty good, it can be very cheap, and like new with bugger all effort. That track looks pretty beast man! I'm gonna start cleaning up my track now. See if I can actually get it running with the current car I have. if the car is AFX (not Tyco or lifelike) which it looks like, to get it going you'll just need a tuneup kit $13-$14. happy to report that unlike the sets and cars which appear to have gone through the roof.. The tuneup kits and the track are still reasonably priced. so not a huge increase. So I cleaned it up (just enough to get a test track going for the one car I have). No go. Looking at the car, the actual cog mechanism doesn't make constant contact, and it looks a little gunky. YEP, that car is AFX, and your track looks in great condition. and you're going to need a tuneup kit! that pinion gear (or motor gear) is GONE. and the spur gear (or axle gear) is on the way out too. Grab a tuneup kit and it'll fix ALL of these problems. all ya gotta do is take out the plastic tab above the pinion, take the back axle off, and then pop the motor out and you can change parts easy. If you get a tuneup kit, I'll just warn you, be careful with the springs that go in the holes next to the guide pin and under the pickup shoes.. if you drop one of those springs.. you are NEVER going to find it.